Khaled obtained his LLB from the Faculty of Law at Alexandria University in 2002. 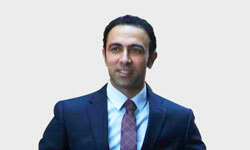 Khaled joined the firm in 2007 in the Corporate Department where he specialised in business, contracts and labor law; he became a partner in 2011. He acts as a representative and advisor for major clients and multinationals corporations. In his litigation practice, Khaled has handled many cases that have yielded good results for valuable multinational clients in both Egypt and Libya. Today, Khaled serves as the head of the Tripoli office. Khaled has also prepared a paper addressing the topic of “Anti-Corruption within the Libyan Government” and it was presented to the representatives of the cabinet. As an ex-Contracts’ Manager in Libya, he has ample experience in negotiating and drafting contracts and agreements, which he is happy to put to use for our clients. Khaled is a member of the Libyan Bar Association, Egyptian Bar Association, International Trademark Association (INTA), and serves as an arbitrator and member of the Ain Shams Arbitration Centre.